MUST ALL TRADITIONS BE FOSSILIZED ? This is the official print and stamp produced by The Department of Environmental Protection, State of Florida. The remarke in the lower left is a small original of a Seahorse added at customer request. The purpose of this post is not to pat myself on the back for winning this contest; it is to tell you the story behind the story and why I think it is important to preserve traditions that allow people to be directly evolved through creative effort.They also invite the public to participate, celebrate, and preserve this shared effort. 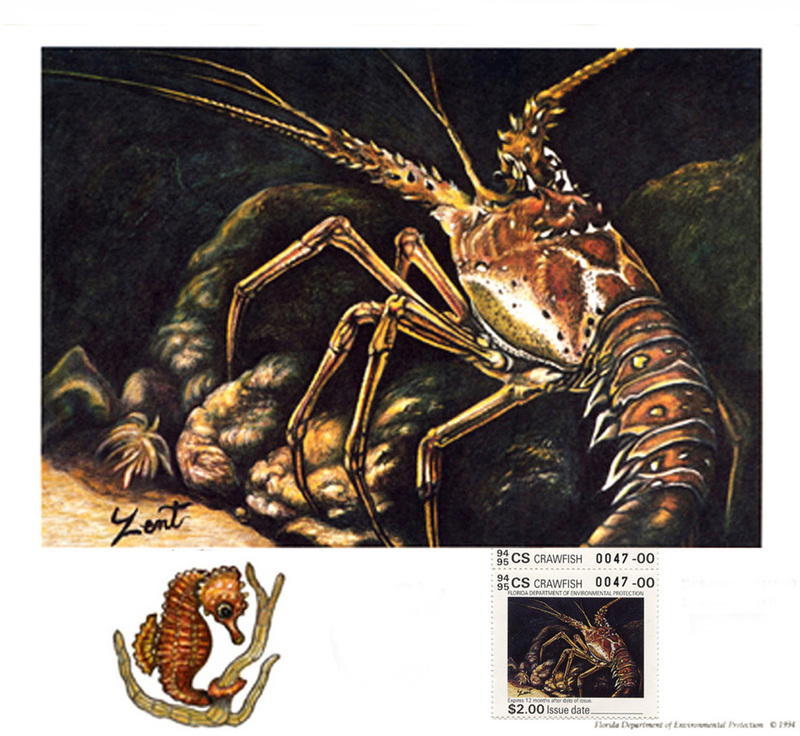 For many years the State of Florida held an annual contest inviting artist to submit designs for the Crawfish and Snook stamps.The stamps were purchased and placed on licences allowing people to fish for the two endangered species. The contest resembled the State Duck Stamp designs and was a coveted award to win. Five qualified judges were selected to cast votes on the designs then 250 limited edition prints were produced for sale to the public as well as the official stamp. Numbers 1-50 were awarded to the first place winners to sale or keep as they saw fit.Winners were also invited to purchase the matching numbered stamps to complete their 50 very elaborate archival, signed and numbered packages. An impressive envelope with pictures and information about the artist was included. The originals were submitted without signature out of fairness so I had to make an appointment to sign my drawing and 200 prints wearing white gloves. I was so nervous that, as you can see on the print, the signature is wavy. Back of envelope provided by The Department of Environmental Protection, State of Florida. I was living in a tiny single wide trailer in a not so good area of Tallahassee, Florida and working as a seamstress in a local sport shirt factory. My autistic son had been accepted in a residential program in Georgia and for the first time in twenty-two years I was alone without the focus of being a caregiver. Three other children were still in college at the Florida State University and the two older ones were making their way through life as adults. I had originals and prints sitting idle because the energy to establish myself as an artist in a new area was beyond even thinking about. On weekends I sat drawing with colored pencils and wondering what was going to happen to me. My mind was still into taking care of Billy, in addition I knew that my health was failing. The only days when depression did not cover me was the every other Sunday trip to Georgia to visit my son and take him on an outing. The sewing factory saved me on weekdays because I had to concentrate on sewing buttonholes on a thousand shirts passing over my desk each day. Finally I was forced to go to Social Services: yes charity to be able to see a doctor who quizzed me about my employment. He discovered that I was allergic to formaldehyde in the fabric passing over the desk in my face. Knowing the cause of health problems was a relief but I could not quit the only source of income. The contest was announced on TV. I mused about how winning would allow me to leave the factory and start establishing myself as an artist locally. Even though it was dreamsville I spent the next month working on a small drawing of the Crawfish, better known as the Spiney Lobster. The size was dictated because it had to be resolved down to a stamp. I researched this animal and refered to photos I had taken as Chief lab assistant in college. The work was submitted and I more or less forgot about it sinking further into depression and ill-health. Then one day I came home to hear the answer machine sitting on the floor beeping. I squatted down and clicked. The voice said, ” This message is for June Zent. Ms. Zent I am calling to congratulate you as the first place winner of the Crawfish Stamp Design for The State of Florida.” There was more but I heard it later because I slumped down on the floor in a heap crying from alternating disbelief and jubilation. It was my ticket out of pain and I knew that the same night because a call of congratulation came in from a lawyer in South Florida. He wanted four prints with a remarke of my choice and numbers matching the dates of his children’s birthdays.He collected them each year as investments for his kids. The order totaled 1,200.oo and their were more! Of course I quit the factory, went for more help from the doctor,and bask in the glow of the publicity . Long story shorter: I landed a job teaching art, started showing my work, and entering more contest. You might ask what this story has to do with tradition. Well, the very last contest was the following year . After that the beautiful stamps consisted of a written line on the licence that was computer generated. No more contest for artist. Gone were the gorgeous pictures on stamps and prints for collectors. Gone too was the money that had been generated via the sales used for protection of these endangered species. Who decided to turn this tradition into an automated bureaucracy, and for what : expediency, laziness, or a callous disregard for the people who connect with each other through participation in this tradition? It has been fossilized and it will not be dug up like bones for science. You can cite many other traditions that have been or are in the process of being stamped out. Will traditions be regulated to stories told of the past? I think that they bond people together and enhance the quality of life provided that hate is not their mission. Do you have a story to share about a lost tradition? I would love to read it. Thank goodness for story tellers! 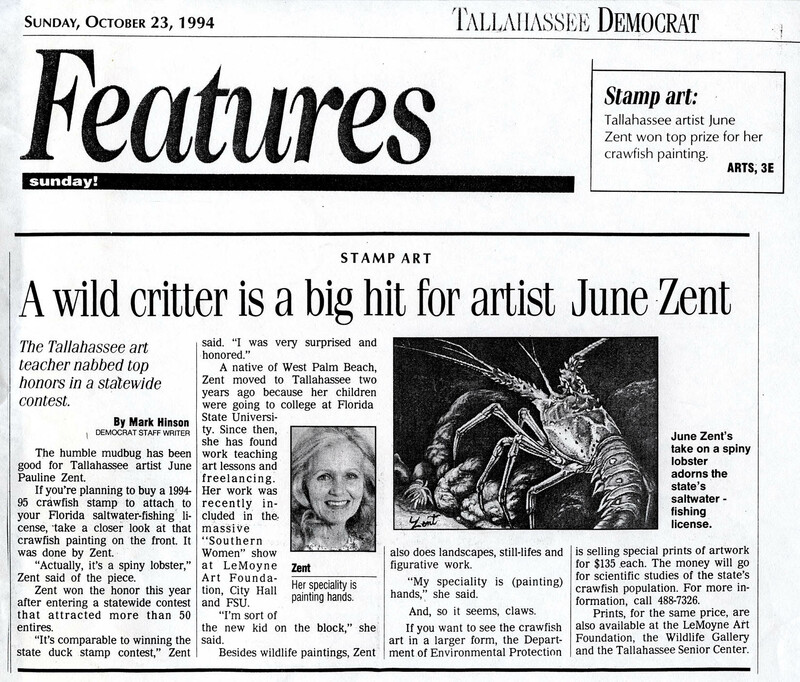 This entry was posted in Original artwork by June Pauline Zent, True Stories About Artwork, Uncategorized and tagged artist, artwork, contest, endangered species, environmental protection, human intrest, insight, stamp art, traditions. Bookmark the permalink. 34 Responses to MUST ALL TRADITIONS BE FOSSILIZED ? Oh, thank you sweet man and friend. Your compliments make me blush but it’s a good thing! I love this story. It’s so great to read about a persons life behind their art. Not only is the art beautiful, a beautiful person too. We all see this.Thank you for sharing. Oh my goodness: What a great compliment. I expected that people would be annoyed with this post but I guess there is still time. If it comes at least i have two bloggers that have made me feel great! Thank you!. The detail in the painting is amazing! The crawfish looks like it’s practically ready to jump out at me. It’s sad to hear that the contest ended but I think often, art in general gets shunted to the side in favor of newer technology and cost efficiency. Technology is all good and well but sometimes I miss the human aspect of things that were made by hand. So true Lillian, that’s why I focus so much on hands and my hands are on the computer right now but I think that Technology and Traditions can live side by side. Traditions speak to people. People speak to computers. Machine and people can get along but neither should be able to destroy the other. Thanks so much for your compliments and I appreciate how you are here every time I post. June, I love this post…it is so full of the struggles an artist goes through to get recognition and feel they can step forward with their talent. Depression, such a hard, dark place to be. You have done so, so much in your career and I so enjoy reading it. It gives me hope in my times of disbelief that I can accomplish this journey. Yes, Mia you will have many ups and downs as an artist. For every contest that I have won there was another that Ii did not even get a mention. Just when you are at the bottom something happens to help you climb out of that pit. I understand completely your struggle to create while your kids must take first place in your time. But remember that you are a wonderful artist now and will grow better from your experience of the struggle and the success of raising your children. Adversity does create character! My sister is in love with your work and believe me she is a strident critic. Keep the faith even when you are at the bottom and you will do good. You are blessed! Thank you Livesinstone for your wonderful comment. I see that you understand what the story is all about and what a loss it is when they are abandoned. Yes, it’s up to storytellers like us to keep the memory alive and hope that someday traditions like this will be given a second chance to benefit society. I have had many up and downs and hope to write more about them for readers like you who get it! Great story June. I’m so impressed, what an honor for you and well deserved I may add. Its a beautiful stamp. Its too bad they stopped such a worthy program that benefitted not only endangered species but artists as well. Oh yes Maggie, It’s hard enough to see perfectly healthy kids go off on their own but one that is hurt and that you have guarded for 22 years is double the pain. It takes a long time to turn your mind away from constant worry but it does happen. Billy is what is called profoundly impaired. He cannot speak or do many other things that others do . He needs 24/7 care but thankfully that is just what this program provides and it is the best available. I truly hope that your son is not that impaired and can on to a more productive life. In any case you will always be his guardian and i am sure you will do the same as me. I see Billy every other Sunday and watch carefully how he is doing. He cannot tell me in words but I know when things are not right. So will you. Thanks for always being there reading my post and if I can help you in any way please let me know. You have to have been there to really understand and you have been there. There so much to know and learn from you June! you are gifted and a real fighter.One who has fought in all circumstances and never let anyone down,alongwth keeping your fabulous art alive through your paintings and through the stroies you speak with it.The paintings have a life and a story of their own,as if you have given birth to them and have reared them individually and wth care. you make everything alive. And its beautiful to see the young JUne! 🙂 🙂 loved your story and proud to be connected with you. Great story, a struggling artist, depression, illness, and finally victory. Well done, it’s tales like this one that keep struggling artists going, they keep me going anyway. Well done. Well JD if that is what it takes for you get ready for more because there have been many struggles with stories to tell in my life. Not all turned out well but all had valuable lessons. thank you so much for the compliments. THEY keep me writing! Thank you for your comments and compliments and it’s great to see you here. Just checked out your blog and I will be following you. That photo of you on the bicycle is awesome and so are other pictures. Have a wonderful day! Well, I am very glad that you do and thanks for the compliments. I enjoy your blog as well and will be checking in often. Oh, you are absolutely right. I did not think of that and it should have been at the end. shows you what kind of writer I am but I do learn. Thank you so much Mlatimerridly for your wonderful comment and compliments. I am glad that you liked it and even happier that you came here! Congratulations June:) It’s a life story that so much impressed me… we have to learn from you; And about the picture : it’s so expressive, touching the reality. Good luck with your work. Thank you Sorina for taking the time to come here and give such wonderful compliments. Yes, I am hoping to be able to help other artist by telling about my struggles and rewards as an artist. It is not an easy life but I would not have any other! smiles! Thank you for sharing wonderful information!!!! Thank you for reading and liking my blog. I will be visiting your’s and getting to know you. Health issues are very important for everyone! Everytime I look at your prints, I am blown away by your talent. You have been truly blessed with an amazing gift! We are both so blessed to have this amazing outlet to express ourselves. You have earned the right to show the world your talent in your post and the world is richer for it.Thank you for being so supportive with your comments! Very well written post. Enjoyed reading! Thanks. Thank you so much for your compliments and for taking the time to come here and write them. they are very much appreciated! Thanks for sharing this experience with us, June. They help to keep us on the ground and underline the fact that nothing comes us easy. I loved reading it and of course, the painting was brilliant. 🙂 Congratulations . Thank you for this great compliment .I do hope that my experiences will help other artist. There are many more to come after I get past this new challenge ! Thank you for your suport; It means a great deal to me!